Home sales in the Betton neighborhoods continue to climb, which is remarkable considering the housing market in Tallahassee is still declining in both the number of homes being sold every day as well as in depreciating home values. This popular Northeast Tallahassee neighborhood currently has 23 homes listed for sale in the Tallahassee MLS, which represents just over 8 months of supply at the current rate of demand. The map above lists all of the home sales in the Betton Neighborhoods through December 23rd of 2011. If you click on a red dot, it will give you the details of the home sale. If you like this feature in the Tallahassee real estate blog, please comment below and let us know its worth adding to our Tallahassee Neighborhood Reports. For our subscribers who receive the Tallahassee Real Estate Blog by email, you must click here to see the map of Betton home sales. In the real estate graph below, the number of home sales each year are recorded as vertical bars (the green portion measure arms length home sales, the red indicates distressed property sales), and the average price each year is shown in brown. 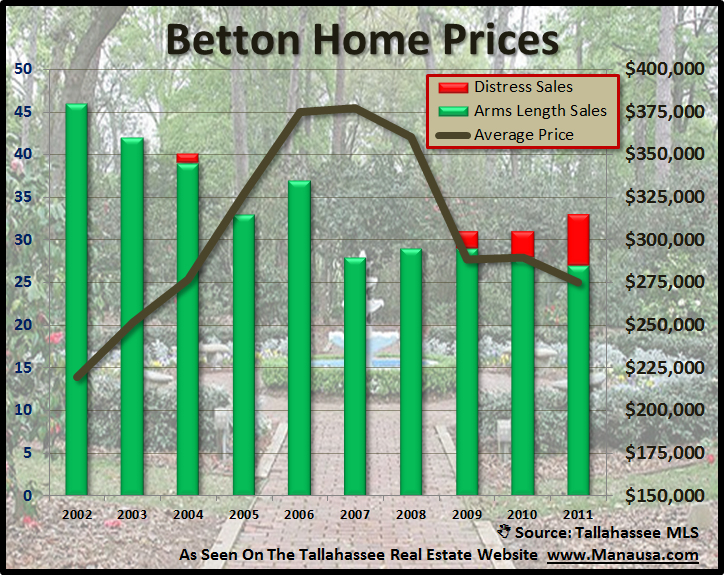 Betton had appeared to be beating the market when the average sales price of a home settled in 2010, but 2011 has brought continued price declines. Homeowners in Betton should be concerned about the growing number of distressed property sales over the past three years. If this trend continues, it could have a huge impact on home values. Currently, the average price of a home sold in the Betton neighborhoods this year is $275,000, down from $290,000 last year. This means that home prices in Betton Hills are down about 27% from the peak of the market in 2007 (the peak for Betton was hit in 2007). 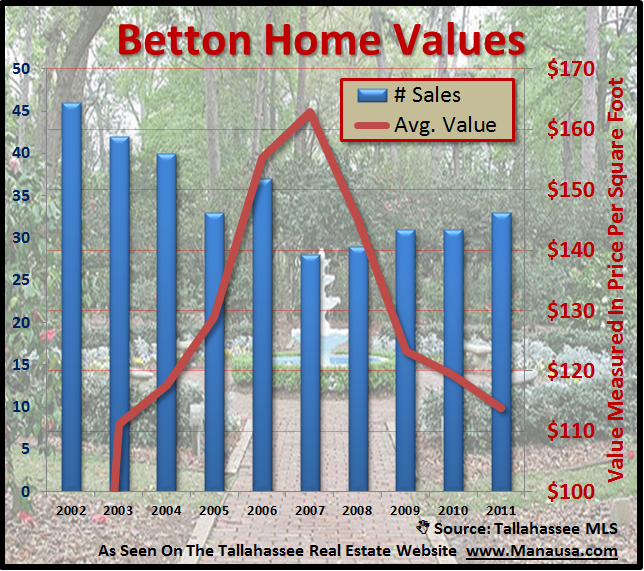 Home values are down 30% since the peak of the market, which is consistent with most other Tallahassee neighborhoods. The average value of a home sold in a Betton neighborhood this year is $114 per square foot, which is 5% lower than the $119 per square foot measured last year. Home values are dropping and more distressed properties are entering the market, meaning pricing pressures are going to continue. People who need to sell a home in Betton who wait two years will have to sell their homes for less money and get less favorable terms from the banks. If you know you're going to have to sell in the next few years, do yourself a big favor and contact me today!